SAL DeTRAGLIA'S VIRTUAL TAPAS BAR: HE REAPPEARS IN A PUFF OF SMOKE. I’m back from a two-week trip to Chicago. It was a good trip for my daughter and me, and man-oh-man...was it nice to be in an English-speaking place for a change. I’d love to tell you all about the trip in a fluid, James Michener-like manner—but my brain still has the numb, disconnected feel of one that has recently flown across seven time zones in the middle of the night. - A mountain of waffles, pancakes and breakfast sausage. * By the way, the foregoing list is only the stuff that I ate outside my family’s respective homes. The stuff I ate *inside* the family compound included venison roasts, apple-brined smoked turkey, beef stew, prime rib, honey-baked ham, lasagna and rigatoni. * And then there was Christmas Eve dinner. It had all the dishes that I described in my earlier childhood food meme post...plus a large platter of Cajun crawfish that was added for purposes of ethnic diversity. There were no jugs of Carlo Rossi dago-red, however. Even nostalgia has its limits. * Despite the shameless display of gluttony that I’ve so meticulously described above, my Grandmother STILL complained that I am too thin. * My grandmother and Uncle Tony made the fourteen-hour trip on Amtrak to spend Christmas with us. But as any seasoned Amtrak-traveller might have guessed, it wasn’t a fourteen-hour trip. It was nineteen hours. That’s the beauty of Amtrak. Their travel time-tables must be converted to dog hours. * My daughter arrived in Chicago speaking 90% Spanish. She left speaking 90% English. It was an amazing transformation. That which she did in two weeks, I haven't been able to do in six years. * Ten years and two daughters later, my relationship with my law school roommate (Tony) hasn’t changed a bit. My daughter and I spent a night at his home in Evanston (near the Northwestern campus). After a fabulous Asian dinner cooked by his wife, we put the babies to bed and tiptoed out the front door. Two pubs and 78 pints of ale later, Tony and I were slouched on his living room sofa watching “Full Circle with Michael Palin” on the VCR. This, by the way, is EXACTLY how we spent four impoverished, stress-filled years at the University of Illinois in the early ‘90’s. * Nothing says brotherly love like three slabs of ribs on the BBQ smoker. Check out the photo above. 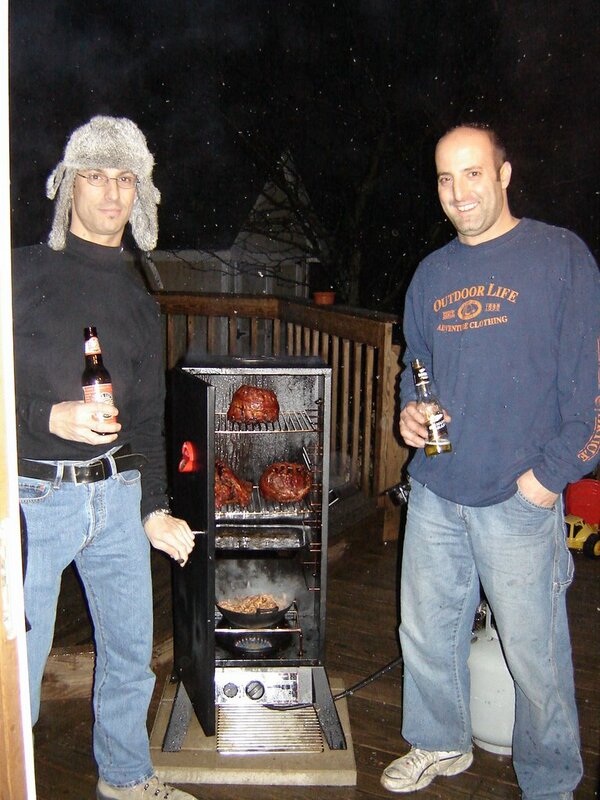 That’s me and my nerdy hat on the left, my brother Todd on the right, and a very unlucky pig in the middle. We used the same smoker to cook an apple-brined turkey on Christmas day. * Health issues run in many families. In mine, it’s skiing-related shoulder fractures. My mother must have envied mine, because now she has her own. * Although I’m no fan of Starbucks coffee, I had to—just HAD TO—walk-around town with a big paper cup of Latte in my hand. I was feeling self-conscious. All the other pedestrians on the sidewalk kept staring at me as if I were nuts. I reckoned it was because I was the only one without a Latte in hand. Then—on the airplane flying back to Spain—I suddenly realized the true reason that they were staring at me. It was the friggin’ hat. We thought you were dead. Glad to see you got some smokin' in. Have a nice nap. when the hell are you going to give us your opinion on "molvania", published by jetlag traver, a truly wonderful book that you continue to ignore? Hey Sal, Oh how we've missed ya! But, what, no brats? I guess you weren't close enough to the Wisconsin border. Good to have you back and writing again..was kinda boring without your wit. Christina: I'm happy to say that I've defeated jet-lag (more or less) in record time. All it took was going to bed at 9:30pm and staying there until 7am. Kick Shoe Cathy: Nope, not dead yet. But in anticipation of the event, I've changed my will. I'm leaving you all the "Do Not Remove Under Penalty of Law" labels on my mattresses and furniture. I hope that you can find a use for them. Perhaps a collage. Anders the Viking: I managed to pack an entire week of Oktoberfest into one night on campus with Tony. BTW...our annual EMEA Sales Conference is approaching and your presence will again be missed. Especially since I'll have to charge my drinks to the Legal Department budget, rather than Commercial Management's. Jeffy-poo: Oh damn! I forgot to buy the Molvania book. Honestly, I meant to buy it. I'll get it in May. Me promise. But let's put this into perspective. At least I've read Catch-22. Lisa: Believe it or not, I *can* find brats here. I eat them pretty frequently. I guess that explains their absence during my pig-o-rama tour of the midwest. On the other hand, I should've bought a case of Rheinlander for old time's sake. My undergrad roomates and I used to buy it in college, because it was the cheapest drinkable beer in the liquor store ($6 per case in 1986). It would make your lips tingle when you drank it, because the bottle rims were chipped on 9 outta 10 bottles. How's THAT for a childhood food memory? Good to have you "home on the blog"! Plus, you won't be surprised to hear, I have a cousin Tony who is actually just 2 months younger than I am. We pretty much grew up togehter. I think there are only about 10 Italian names and they just get used time and again! Christina: Despite my weight ballooning up to 145 lbs., the airlne didn't charge me extra. Rather, the flight attendant handed me a $10 bill. CuFoo: In addition to my Uncle Tony, I have a cousin, nephew and several great Uncle's with the same name. There are also a smattering of "Joe's" in my family. Oddly, however, we don't have a single "Peter." I've got a friend, Kirk (Delici-Yoso), who could really give you a run for your money consumption wise. Have you ever done Korean? Be-bim-bop! Love it. Kimchee-fried rice! Love it. My law school roommate (Tony) is Korean, and was a very good tutor tummy-wise. I could eat kimchee all day long...except that I probably couldn't because my tongue and stomach would eventually rebel on me...but still, I'd love to try.